First Prize: Dr Trevor Nicholson, St Vincents University Hospital, for his presentation ‘Variation in urban air pollution levels and risk of acute exacerbation of Cystic Fibrosis’. Second Prize: Dr John Steer, North Tyneside General Hospital, Newcastle-upon-Tyne, UK, for his presentation ‘Comparison of indices of nutritional status in prediction of in-hospital mortality and early readmission of patients with acute exacerbations of COPD’. 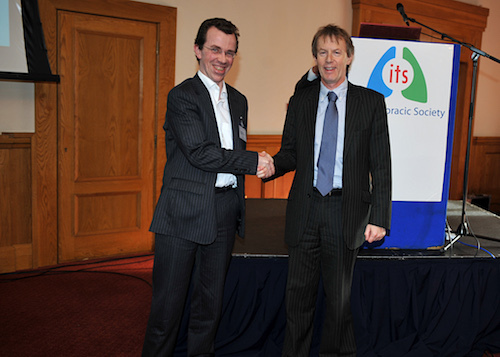 Dr Trevor Nicholson pictured receiving his award from Dr Colin Edwards, General Manager, Boehringer Ingelheim Ireland. 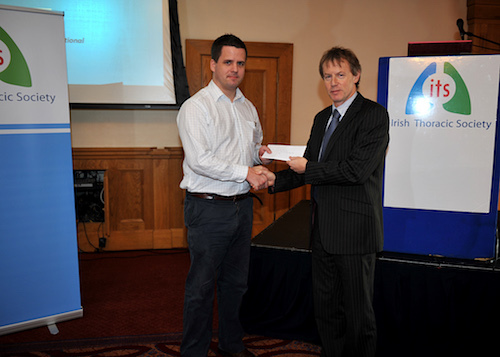 Dr Stephen Bourke pictured receiving the award on behalf of Dr John Steer from Dr Colin Edwards, General Manager, Boehringer Ingelheim Ireland.